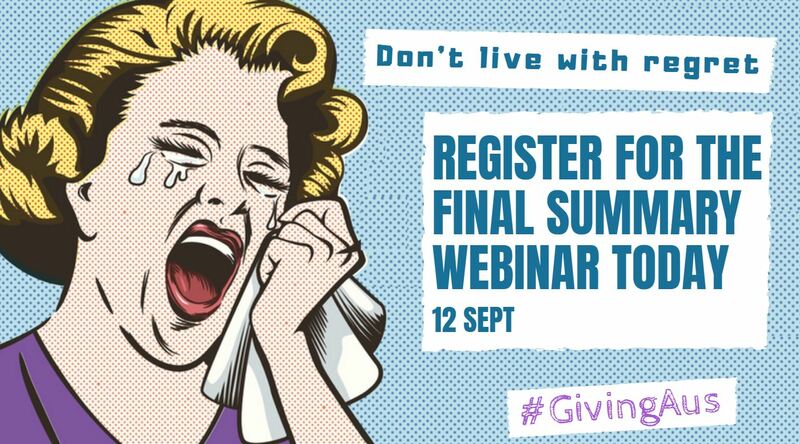 Whether you know loads about #GivingAus or you’re just hearing about it now, you won’t want to miss this webinar! Giving Australia is the largest ever national analysis of giving and volunteering undertaken in this country. Its findings and insights are informing the way nonprofits operate in many areas, from governance to ethical marketing and fundraising. Combining the best of all previous #GivingAus webinars and reports, this webinar will bring all the major facts, figures and key messages together. Don’t miss this chance to glean practical tips and powerful insights that YOU can put into practice today! The latest stats on who gives, how much they give and what motivates the everyday Australian to give and volunteer. What motivates giving, what matters to donors and how do they want to give? Great tips and advice you need to know. How much does business give to charity? And just how much does workplace giving and volunteering contribute to giving overall? You might be surprised. What can you learn from the ways in which charities facilitate giving and volunteering? A look at out-of the-box practices that attract the most support, to the uptake of new technologies to make giving easier. So what have we learnt? Using the findings from #GivingAus, we’ll discuss how the data can help nonprofits in their fundraising and the ways in which each one of us can play a part in strengthening giving. Giving Australia reports and fact sheets are freely available via the Prime Minister’s Community Business Partnership research projects website. *Giving Australia was commissioned by the Australian Government Department of Social Services as an initiative of the Prime Minister’s Community Business Partnership. It was led by the Australian Centre for Philanthropy and Nonprofit Studies (ACPNS) at QUT with the Centre for Social Impact at Swinburne University of Technology and the Centre for Corporate Public Affairs.